Description: Tentacles stout, moderate in length, arranged in multiples of ten. The column is divided into scapus and capitulum, with prominent parapet and fosse. Scapus with small, pale coloured, non-adhesive warts. Colour usually brighter and paler than Urticina felina, usually in shades of red, orange or yellowish buff, occasionally with blue-grey disc. The disc pattern resembles that of Urticina felina. Typically about 300mm in diameter. 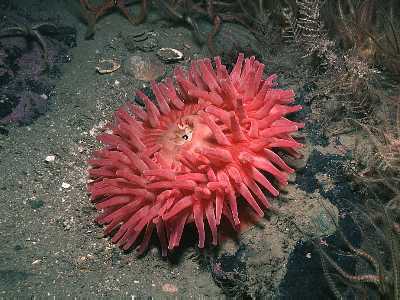 Habitat: On rocks and shells, often inside empty bivalve shells resting on the bottom. Occasional on the lower shore but usually sublittoral, in sea lochs and other enclosed areas, down to 100m. Distribution: All British and Irish coasts except in the English Channel, also in northwest Europe. Possibly circumpolar but may have been confused with other species. Similar Species: This species grows larger than its close relative Urticina felina, up to 350mm across the tentacles and 250mm across the base. Tentacles arranged in multiples of ten. Paler coloration than Urticina felina, usually red or orange. Picton, B.E. & Morrow, C.C. (2016). Urticina eques (Gosse, 1859). [In] Encyclopedia of Marine Life of Britain and Ireland.